Contemporary art is heir to more than a century of avant-garde experimentation, transgressing boundaries, rejecting tradition, and breaking rules. At first sight, the work of Ignacio Uriarte seems the very antithesis of the playful antics of his fellow artists. Far from being transgressive, it reflects his decision, reported in a artist’s statement from 2006, “to stay in my own personal ‘petit-bourgeois’ reality in order to deal with it from the inside“. He decided to use only the tools and materials he had grown used to while doing office work before he was able to dedicate himself fully to his art: Ball-point pens and coloured pencils, A4 paper, rulers, binders and typewriters. Instead of breaking rules, he sets himself more rules, limiting his art to the most mundane and ‘inartistic’ environment of modern life. He lines up rulers to make new shapes, crumples up sheets of typing paper and drops them into waste baskets or rearranges binders on utilitarian metal shelves, much as a bored office worker might when the supervisor isn’t looking. Even his drawings refer to this environment: Often A4-shaped, obsessively filled with doodles or ruled lines, often using only the standard colours of ball-point ink. Yet Uriarte’s art is very much a product of the avant-garde. He himself has expressed an aesthetic preference for the “conceptual and minimal art of the 60s and 70s” and certain comparisons can easily be made, such as of the preference for mass-produced materials which echoes that of the early minimalists and the economy of expression that was one of the hallmarks of conceptual art. These are proven artistic approaches and while many contemporaries predicted that these movements would be short-lived, they have been shown to have endless possibilities that are still being mined by artists around the world in all possible contexts. To limit them to the world of office work can seem an unpromising restriction but perhaps it is this very aspect that shows the depth of Uriarte’s commitment to his avant-garde roots. For this background we should think not of Dada cabarets or Surrealist improvisation but of another strain of avant-garde production, perhaps best exemplified by the writers of the Oulipo group that included Raymond Queneau, Georges Perec and Italo Calvino. In order to revive literature they decided not to break old rules but to set themselves new ones: Perec wrote a 300 page novel without using the letter ‘e’; Queneau retold a trivial story ninety nine times, each time in a different style. This methodical approach underlies much of the most radical literature and art produced in the 1960s and 1970s, from the serial music of Terry Riley to the serialised chocolate sculptures of Dieter Roth. Far from restricting creativity, the methodology opens up the aesthetic possibilities inherent in the simplest, most common materials. The series 1s & 0s (2011–2014) reveals how Uriarte exploits these possibilities on several levels while paying homage to his predecessors among the Fluxus artists of the 1960s. 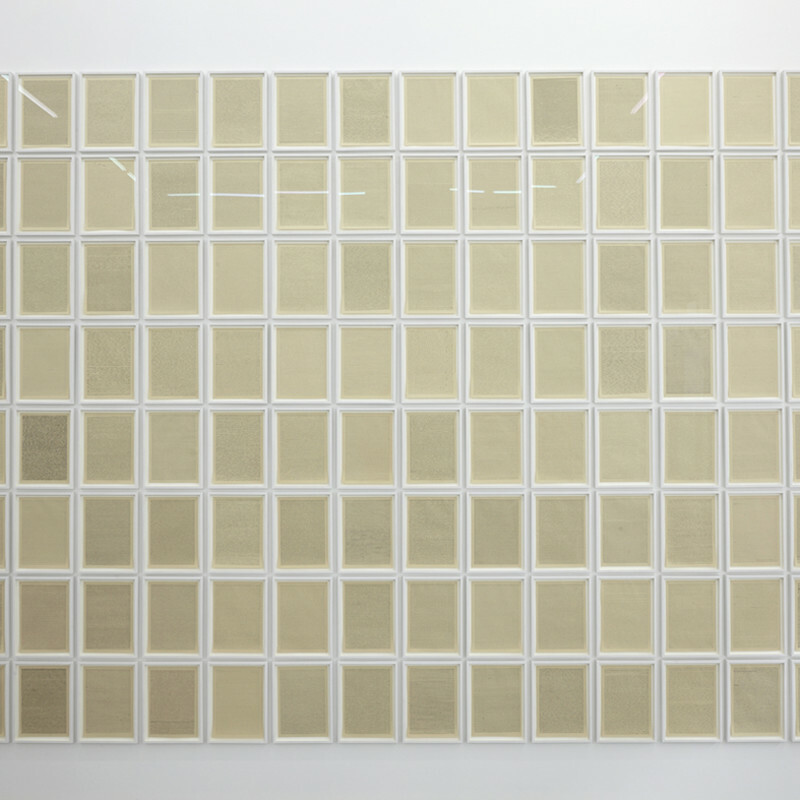 The series comprises 128 sheets of A4 paper, covered in typewritten 1s and 0s. Each sheet is typed on a different typewriter found in the collection of a sixty year old office supply company in Vigo, Spain. The different typewriters produce very different results. Each has a subtly different style of lettering and the mechanisms, as well as the state of the ribbons, result in a variety of shades and textures. Mistakes due to mechanical quirks add interest to the otherwise uniform series of numerals. Typewriters were the tool of choice for many of the Fluxus artists of the 1960s. The anthology Typewriter Poems (1972, edited by Peter Finch and published by Something Else Press) collected their efforts and showed what a powerfully expressive medium typewritten text can be. Uriarte’s series reveals some of this expressiveness, almost as though by accident, as each typewriter has its unique character or personality. For those of us who grew up before computers replaced the old mechanical machines, seeing one of these sheets is like meeting an old friend; even the mechanical mistakes bring back fond memories. In comparison, computers seem cold and soulless with their perfectly rendered type and unmoving uniformity. Uriarte plays on this comparison and on the strange nostalgia we feel for the old office machines. 1s and 0s in series are a language that belongs to the computer age and can, in fact, only be read by computers. It is not meant to be seen by human eyes; it is the computer’s private language. Even to print it out seems futile but to painstakingly type it on decades old typewriters takes this to the level of obsession. The result can only be, in Uriarte’s words, “an indecipherable mumble”. If Fluxus liberated the typewriter from the office and revealed its expressiveness, Uriarte’s work shows how painfully inexpressive our computerised office world has become. His attempt to reconcile the computerised present with our nostalgia for the mechanical past is like a failed tryst with an old lover: Too much time has passed, too much has changed, and all that now remains is a memory, like a faded photograph. The two other series in this exhibition are more formal explorations. The Four Colour Documents(2012–2013) are visual conjugations, each one showing four rectangles, of the size and ratio of A4 paper, created with lines in four basic colours: Black, blue, red and green. The rectangles are placed in different positions on the field, overlapping and creating different moiré effects and colour illusions as they interact. The drawings are an attempt at exhausting the possible interactions of these elements, to provide a complete and rigorous system, but instead of looking predictable they surprise us by turning the different configurations into a playfully choreographed dance, light and airy rather than sombre and stiff. This is very much in the vein of Uriarte’s earlier work, such as his geometrical arrangements of office rulers, in revealing the playful possibilities inherent in even the most strictly regimented environments. The sixteen drawings of the Amorphous Transition Matrix (2013–2014) reflect a slightly different approach. Beginning with a quickly drawn gesture, they show irregular oval outlines filled in with methodical scribbles, graded from the edges to give a texture and shape to the simple forms. Like the Four Colour Documents, these drawings exploit the ambivalent relationship of method and play, transforming a playful gesture into a methodical project which, again, results in a strangely organic object emerging on the paper. As with all of Uriarte’s work, these three series work on many different levels. As strictly organised exercises – in the manner of Oulipo – they aim for completeness, exploring all the possibilities inherent in the rules the artist has set. The rules are clear and we see at a glance how they play out in each series. And yet there are surprises, unexpected transitions where regimentation segues over into play and we see glimpses of humour emerging from what otherwise might have been only mindless repetition. To see this accomplished with mere office supplies seems little short of a miracle.